This bed was easy to assemble and color is very beautiful. We have been using it for over a year now and it is just as sturdy as when we put it together. I feel we definitely got the value we paid for. Update your bedroom with this chic metal bed by iNSPIRE Q® Bold collection. The curved headboard and matching footboard add just the right amount of vintage charm. The metal bed is finished in champagne gold for a touch of glam style. Great bed and great price! I’m super happy with my purchase! The color is more of a rose gold in my opinion but still works perfectly in a dark room. Assembly was a breeze. Took less than 20 minutes. It did arrive in two boxes on two separate days. I wasn’t aware it would be shipped in two boxes nor did I receive a tracking number for the second box. It wasn’t a big deal in my case because I didn’t need the bed right away but just be aware you can’t assemble until the second box arrives. Shipping took about a week. Boxes arrived within 3 days of each other. I was pleasantly surprised by this bed! It’s incredibly sturdy and best of all it doesn’t creek if there’s movement. I purchased this with a metal bed frame and couldn’t be happier. I think it’ll last a long time. The color was also accurate and after having it for 6 months I don’t have any unsightly scratching or anything of the sort. Glad I took the leap and bough it. Also keep in mind that this comes shipped in two separate packages! You may get one before the other but mine happened to come the same day, just at different times. My daughter loves this bed and we get so many compliments on it! Overstock has the worst delivery system world wide. Pieces arrived on separate dates then I was told certain times which weren't true. They said, the bed don't know because haven't put together yet. When i do will upgrade review. This product ships in 2 boxes, we initially only received the one box so we had to call overstock to get the missing pieces. Customer Service was great - missing items arrived quickly. Bed was easy to assemble and is very sturdy!!! Great buy! Great guest bedroom bed! Love the style and the color so much. I get compliments on this all the time. Only thing is -- no matter how many adjustments we have done, it still creaks slightly. Just something to keep in mind. Ordered the champagne frame and it was a glowing warm tone - almost a rose gold. So easy to put together - took less than 20 minutes. Sturdy and stately. Just a beauty! This bed frame is sturdy, was easy to put together and was shipped quickly. It does haves some superficial scratches but the color is so lovely it doesn't matter. It has exceeded my expectations. Arrived quickly, bed is pretty, easy to put together and sturdy, no squeaks or creaks when you move on it. Very happy with the product, the price and with Overstock. Great frame, glad I bought it. I love this bed,the color is really pretty. It looks as if it is expensive but got a great deal on overstock. I'm very pleased with this purchase. "What is the weight limit on this bed frame?" This item has not been weight tested. 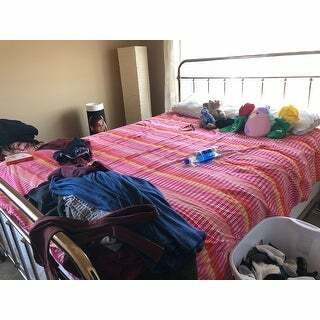 Similar items can support a maximum of 250 pounds in twin size and 500 pounds for full and queen size. "What size box spring is in the picture? How many inches?" Unfortunately we don't have this information. We apologize for nay inconvenience we might have caused. "Can the headboard and footboard be attached to an existing standard bed frame? Or can it only be used with the included frame?" We recommend using the include frame for the best fit. "Will this support a mattress on its own or do you need a boxspring?" 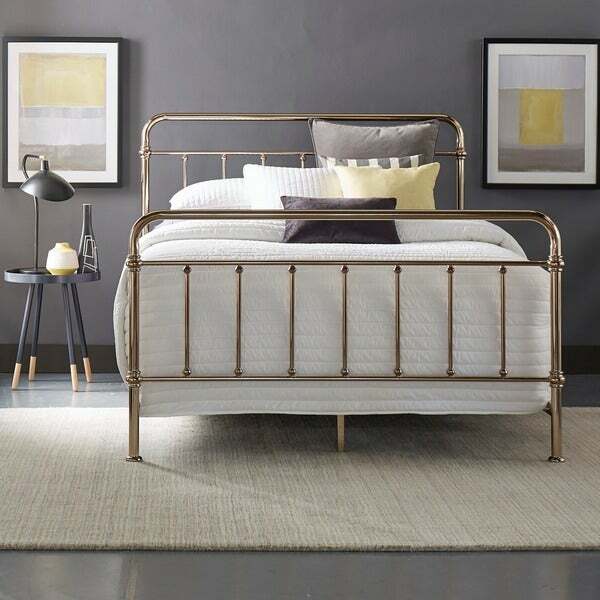 The Giselle Graceful Lines Victorian Champagne Gold Metal Bed by INSPIRE Q requires both a mattress and box spring for use.